There are many reasons that health care facilities look into purchasing refurbished linear accelerators verse new. Most assume that refurbished medical equipment is purchased solely because it is more affordable than new however that is not the only reason to consider. When medical facilities are not exclusively treating patients seeking radiation using a linear accelerator there may not be the funds to support the expense. Health care centers that treat less than ten patients a day using a LINAC benefit from purchasing a refurbished system. A previously owned, refurbished linear accelerator is less expensive and thus the monthly expense to lease/finance is lower. What this means for your facility is that the payment is able to be covered by the few patients being treated daily. When a medical facility is located in an area where facilities need to be profitable to continue running and compensation rates are low it is important to keep expenses low. Public clinics don’t need to worry about being lucrative however that is not the same for all health care facilities. When a medical facility is using a LINAC system and only requires partial use of its technologies then a refurbished linear accelerator is a perfect choice. Many veterinarians choose to purchase refurbished linear accelerators to treat pets and animals. They don’t require all the bells and whistles found in new radiation so refurbished equipment makes sense. When a medical facility is just opening, they may not have the revenue base to purchase more expensive medical equipment with the newest technologies. Healthcare facilities that are looking to upgrade to new technology in four to seven years but need to treat patients and generate funds benefit from purchasing refurbished medical equipment. Health care centers often want to buy brand new equipment when starting out, but it is a huge risk to invest capital that is not guaranteed in such expenses. Pre-owned, refurbished LINAC help to mitigate the risks while allowing facilities to effectively treat patients. When a medical facility has one linear accelerator but intends to move locations and are unable to have down-time the purchase of a refurbished machine is a good idea. Linear accelerator relocation can take upwards of four weeks so many facilities choose to purchase an identical machine to install at the new center. When the move has been completed the equipment can be sold or kept as a backup. When a medical facility wants to ensure they are always able to treat their patients a back up linear accelerator is necessary. This is often the case when a facility has a large patient load. When the main LINAC is down for maintenance or repair patients can still be treated using a back up machine. Refurbished linear accelerators are a great backup solution. As an independent LINAC service company, Acceletronics is dedicated to delivering the best equipment performance and services for linear accelerators and CT scanners across all major brands and models, as well as new and refurbished LINAC systems for sale. More information can be found online at https://www.acceletronics.com/. There are several questions that come along with a cancer diagnosis. One of the first questions that patients ask is regarding the treatment of their newly diagnosed cancer. Patients want to know how they are going to rid their body of cancer. The answer most often, external radiotherapy. External radiation, radiotherapy is treatment of cancer using a machine known as a linear accelerator to directly aim radiation beams to the cancerous tumors from outside the body. These beams are meant to shrink and/or destroy the cancerous tumor without harming the healthy tissue surrounding it. This is different from internal radiotherapy where radiation is delivered to the cancerous tumor within the body. Radiotherapy works through a process of damaging the DNA that exists within the cancer cells. A patient’s personal DNA, which is genetic, is the code that controls how a patient’s body will behave during treatment. Before a patient starts treatment their team of experts will create a plan and introduce it to the patient. It will include several elements including the short and long terms side effects of radiation. Most side effects are short terms and will disappear with medication and time. These scans and images will allow experts to develop a treatment plan that allows the highest dose of radiation to the cancer while trying to reduce the effects to the healthy tissues surrounding it. When you are set to receive external radiotherapy you will have treatment in a radiotherapy department. Radiotherapy machines are large and can vary. The most common machine in delivering radiation is known as a linear accelerator, LINAC. A linear accelerator uses an electricity to create the beams of radiation. Patients will not feel the radiation that a LINAC gives off. There are possible side effects however these are rare. Radiation therapy works because it can treat the cancerous cells and the bordering healthy tissues without harm. A high dose of therapy is given directly to the cancer and lower dose to the surrounding tissues. Radiation is delivered in individual fractions that are smaller than the full dose. This ensures that the healthy cells surrounding the cancer to recover between treatments. Patients will have what is known as a series of smaller dose treatments which is known as radiotherapy fractions. Radiotherapy is intended to relieve the symptoms of cancer including pain. This is known as a type of palliative radiotherapy, fewer fractions and sometimes just one. The radiotherapy dose with each radiotherapy fraction is larger but there are fewer fractions. Overall the radiotherapy dose is lower. Palliative treatment has a decrease in side effects and is used as a cure for cancer. The pressure is high for the leaders of medical facilities to keep up on the changing technology of medical equipment, improve the quality of patient care, and reduce costs of medical equipment maintenance and care. Creating a cost saving strategy in medical equipment maintenance allows facility leaders to stay ahead of their competition without budget concerns. One way many healthcare facilities have chosen to do this is through outsourcing. This allows medical facilities to purchase service and repair contracts from companies that specialize in the service and repair of large scaled medical equipment such as linear accelerators and CT scanners. Healthcare centers rely on medical equipment to provide the highest quality of care to patients at all times. It is crucial that your facility have a system in place to manage, maintain, and repair high end, technologically advanced medical equipment like LINAC. This can be done simply by contracting services through an OEM or third-party service provider. Facilities must have a strategy in place that fits their exact needs including both maintenance and repair. What times of the day is equipment used for patient care? Are back-up systems available if the main piece of equipment is down? How old is the current equipment? What is the service history of the equipment? Choose an 8 am to 5 pm, Monday-Friday option for service and maintenance. Combine equipment and facilities into a single contract. Even with contracted services there should be an in-house program to support it. There are quite a few cost saving strategies including the assessment of available staff, the competency of your staff, the history of equipment, and the level of risk the hospital wants to assume. Determine your staff’s availability and capability. The staff should attend training and expectations of the level of support to be given for each piece of equipment should be determined. Do a complete cost/benefit analysis between a full-service contract vs a combination of contracted services and staff maintenance. Remember to consider the costs associated with training, parts, and additional tools/equipment that would be needed. Review the historical data on the expense of labor and parts for each piece of equipment. This will help you determine the cost of parts and labor under contract if you wouldn’t have had a contract in place vs having the contract in place. After doing research and analysis on your existing equipment you should have a good idea on which type of service contract best suits your company. Linear accelerator maintenance, repair, service, and parts will obviously cost more than then the same services on a hospital bed. These are the things that facility leaders need to account for when contracting with an OEM or third-party service company. There is a lot of information on radiation therapy online. The process of delivering radiation isn’t exactly the same between facilities however it’s similar. In this installment we will look into radiation therapy generically to provide a general overview. There are a number of ways to treat cancer with radiation; the method used depends on the nature and position of your cancer. The most prevalent method of radiation is known as external beam therapy. This is often done using a linear accelerator from the outside of the body directing radiation to the tumor. Radiation therapy is known to affect both cancerous and normal cells. Radiation has a greater effect on cancerous cells. Treatment is given at the highest dose possible, within a safe limit, to kill cancerous cells without causing damage to normal, healthy cells. If the goal is to reduce the size of the tumor in order to relieve symptoms or to shrink the tumor for surgery, low dosages are often used. Radiation therapy is planned out by a specialist cancer doctor known as a radiation oncologist. Then radiation is delivered by a radiation therapist. A team of specialists including nurses, health care assistants, counselors, and dieticians will work together to ensure the best possible outcome for your treatment. There are many benefits included in how radiation treatment is planned. Each patient has a unique treatment plan that is designed to meet each patient’s particular need. During the initial visit a course of treatment will be planned. This is done using simulators, x-rays, and scans to pinpoint the tumor. The skin will be marked to define the treatment area. Most individuals receiving radiation therapy will not need to stay overnight in a hospital after receiving radiation. Therapy is done on an outpatient need unless your radiation oncologist determines that treatment would be more effective if done while admitted. Patients are allowed to continue life as normal during their radiation treatment. It should not cause too much interruption to your day, in fact it should be looked at as another daily routine activity. Radiation is given using a linear accelerator which works by delivering radiation from the outside through your skin. Patients receiving treatment lay on a treatment couch and are asked to remain completely still. Radiation oncologists will determine the length of treatment needed when first evaluating your situation. The course of treatment can last anywhere from a week to six and can be performed on a weekly or daily basis. This will depend on a number of factors including the area that is being treated, the aim of the treatment, and more. Each session of radiation varies depending on the machine used. Most sessions last between five and fifteen minutes. A drive stand is a large part of a linear accelerator. It is a cabinet in the shape of a rectangle that is attached to the floor within the treatment room. The horizontal axis bearings that the gantry rotates on are positioned within the drive stand. A Klystron is responsible for the microwave power that is used to accelerator the electrons. This process occurs through intensification of present RF (Radio Frequency) electromagnetic waves. The basic description of the operation of a Klystron is that it is a RF amplifier. A Klystron is often chosen for LINAC needing larger amounts of electron energy. A magnetron can be used in place of a Klystron. A Magnetron is an electron tube that is responsible for providing the microwave power to accelerator electrons. A Magnetron is often chosen for LINAC needing smaller amounts of electron energy such as 4 MeV to 6 MeV LINAC. The structure in which the microwave powered RF electromagnetic waves are accelerated from the Klystron or Magnetron. The circulator connects the Klystron or Magnetron to the RF Waveguide. A cooling system is in place to prevent overheating. It creates a stable temperature environment within the Drive Stand and Gantry. A gantry rotates three hundred and sixty degrees around a single point. It works by directing the radiation beam from the LINAC to the tumor without moving the patient. The treatment head of a linear accelerator encompass the components that shape and monitor the radiation beam. These components include bending magnet, collimator, ion chambers, tray slots, wedges, blocks, and compensators. The modulator cabinet is the loudest components of a linear accelerator. This component is located within the radiation treatment room. The modulator cabinet includes a fan control, auxiliary power distribution system, and a primary power distribution system. The fan control is used to cool off the power distribution systems. The power distribution systems include the emergency off button to shut down the power to the LINAC. A bending magnet is a component of a LINAC that changes the direction of the beam down towards the patient. It bends the beam towards the target and produces different paths for the beam for different energy needs. As promised in our last blog post today we will dive into the concept of radiation therapy. In our last installment we discussed linear accelerators and how the radiation beam is produced and delivered. If you are unfamiliar with LINAC and how radiation is created and delivered look back at our previous blog post before continuing. The treatment of cancer with radiation is known as radiation therapy. Depending on the type of cancer you have been diagnosed with will depend on the way radiation therapy is delivered to your tumor(s). 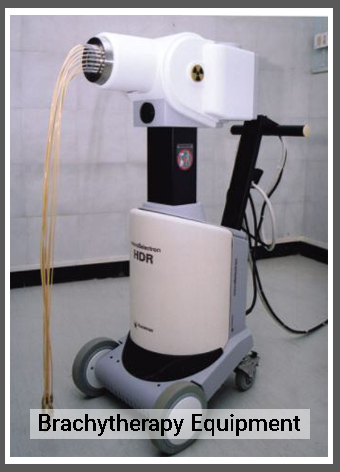 The most common method of radiation therapy is external beam therapy. This involves delivery of radiation to the cancerous tumors from outside of the body. The radiation is delivered directly to the tumor. A LINAC allows the radiation beam to be shaped in the same shape as the cancerous tumor. Another option of radiation therapy is internal radiation therapy. This treatment involves implanting radiation directly onto the cancerous tumor. The nature of the cancer being treated will determine the type of radiation therapy delivered. Radiation therapy does not distinguish between healthy and cancerous cells although the effect is greater on cancerous cells. The highest dose of radiation possible is delivered to the cancerous tumor in the attempt to kill, break down, and shrink tumor. Smaller doses of radiation can be delivered when palliative care is the goal. The goal of palliative care is to relive symptoms of cancer by shrinking the size of the tumor. Palliative care is focused on increasing the quality of life left for a patient and their family. A radiotherapist/radiation oncologist is what we refer to as a physician specializing in the treatment of cancer. This individual is the person that will plan and oversee your treatment from beginning until the end of treatment. Radiation is delivered by a professional known as a radiation specialist. A team of professionals will work with your specialists to ensure you are receiving the best care possible. Some of the members of this team include: nurses, health care assistants, counselors, and dietitians. Each course of radiation therapy is uniquely designed for the patient that is being treated. A preliminary appointment will be scheduled in which you will discuss your course of treatment. This plan is created by your radiation oncologist and radiation therapist using all the scans and x-rays that have been taken of your cancerous tumor. The skin is colored in to define the location of the tumor and where the treatment will be delivered. If radiation is being delivered to your head a head shell will be created for you that allows for the exact placement of treatment to be marked on the shell vs on your skin. Treating cancer in the mouth or throat will require a dental assessment to determine if dental treatment is needed before radiation can be delivered. Patients that can go to and from the hospital easily will most likely be allowed to have outpatient radiation therapy. Your radiation oncologist will tell you if they would prefer your treatment to be inpatient but overall most treatment is done on an outpatient basis. Over the course of radiation therapy, patients will be asked to have an occasional blood draw or urinalysis completed. 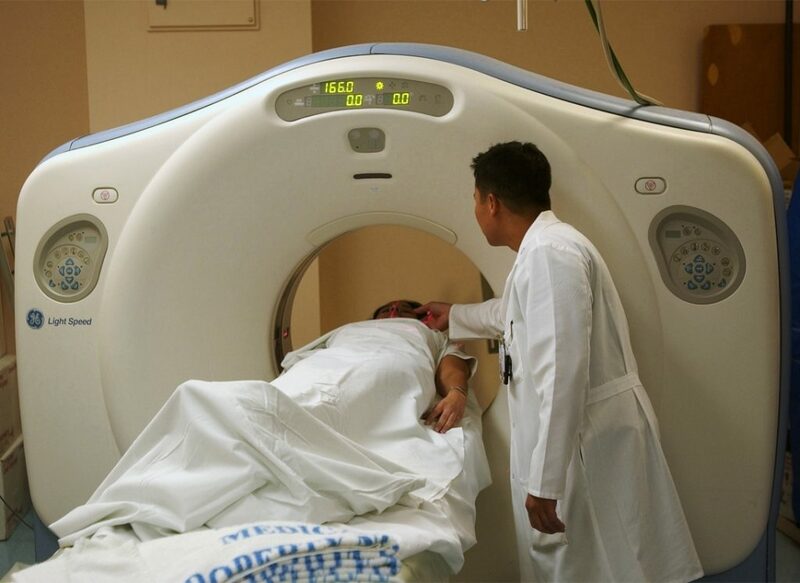 X-rays and other scans can also be required to determine if the radiation is working and if the placement of the treatment is correct based on the shrinking or break down of the tumor. Radiation therapy should be considered an interruption to normal life. Your daily life can be continued as normal if you are feeling emotionally and physically able. Delivery – External radiation therapy is delivered using a machine known as a linear accelerator which was described in detail in our last installment. For radiation to be delivered, you as the patient will be asked to lie on a couch under the LINAC and will need to remain still until the treatment is over. Pain – Radiation therapy is painless. The radiation can not be felt or seen during delivery. Radioactivity – Patients always wonder if they will be radioactive after receiving radiation therapy. You can rest assured that you will not be radioactive, there is no possible way for this to occur. Duration – The duration of treatment will be decided by your radiation oncologist. A course of radiation can be between one treatment to one every day, for one week to six weeks. This will all depend on the type of cancer being treated, the dose of radiation needed, the part of the body being treated, and the aim at therapy whether it is therapeutic or palliative. Length of Sessions – The length of each radiation session varies between machines and what is planned in your specific treatment plan. Some LINAC operate at a faster rate than others. Some cancerous tumors respond better to longer treatment sessions with smaller doses of radiation. On average patients can expect that their sessions will last between five and fifteen minutes. Patients can keep on working as usual as long as they are feeling able and their radiation oncologists agree. If your oncologist suggests time off for rest, it is best to listen to them and avoid work. If you do have any of the above side effects, it can be assumed that they will end after a week or two. The full benefits of radiation can usually be reached after a few weeks. You will follow up with your specialists after four to six weeks of your final radiation treatment. This will all be determined by your radiation therapist. How Does A Linear Accelerator Improve Radiation Therapy? With todays technology treating cancer through radiation therapy is completely customized to each specific patient’s need. Linear accelerators deliver cutting-edge radiation therapy; providing one of the most advanced cancer treatment techniques available. Linear accelerators are able to deliver targeted radiation beams directly onto a patient’s cancerous growths with minimal damage to the healthy surrounding tissue. Oncologists often recommend radiation therapy using linear accelerator technology to treat new cancer diagnosis as it often improves the chance of a good outcome. Below are a number of the benefits that cancer patients find that LINAC offer in cancer treatment. Using detailed imagery linear accelerators pinpoint cancerous tumors with amazing precision. 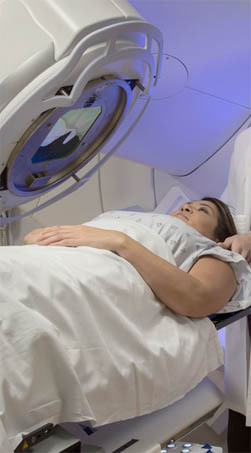 This technique is known as image-guided radiation therapy. Treatment with LINAC allows for radiologists to compensate for the shrinkage of the tumor and its movement. Radiation therapists will treat tumors individually before each treatment session to account for the varying size and shape of the tumor and its changing position in the body. This allows them to directly deliver radiation to the cancerous cells to shrink and destroy them. Technicians can target cancer more accurately which decreases the risk to healthy tissue. Cancer can grow in any part of your body. Thankfully, linear accelerators are able to treat them wherever they are. Radiation therapy, using linear accelerators allows for the targeting of cancerous growths no matter where they are including: prostate, uterus, cervix, and/or prostate. With the advanced technology in treating cancer that linear accelerators offer, specialists are able to monitor and adjust for shrinking tumors on a daily basis. This means that each treatment is aimed more directly at the cancerous tumor which increases the effectiveness of the treatment and encourages a higher cure rate. Treating cancer can seem incredible scary. Treatment sessions can be long and uncomfortable but thankfully treating cancer with linear accelerators makes radiation sessions faster and more comfortable. LINAC treatment sessions which may have lasted 10 to 30 minutes can now be completed in less than two minutes. Quicker treatments make more patients less anxious and more comfortable. It is easy to see how LINAC improve the treatment of cancer. Linear accelerators make cancer treatment faster, increase cure rates, and can be customized to each individual’s patients needs. Radiation therapist plans develop personalized treatment plans that include education and support. Author adminPosted on January 23, 2019 April 4, 2019 Categories AcceletronicsTags ct scanner repair, linac parts, refurbished ct, refurbished ct scanner, refurbished linear accelerator, refurbished linear accelerators, refurbished radiology equipmentLeave a comment on How Does A Linear Accelerator Improve Radiation Therapy? There are several common types of radiation therapy that are used in treating cancer today. Radiation therapy is classified according to the type of radiation particles or waves that are used in treatment which include: photons, electrons, or protons. The most commonly available treatments using photons and electrons. In this installment we will look further into treatments using linear accelerators, LINAC, and CT Scanners, in the treatment of cancerous tumors. 3D conformal radiation therapy is a method of treating cancer that uses CT imaging, Cat scan-based, in the treatment of cancerous tumors. In 3D conformal radiation therapy, the tumors and organs are well-defined 3D images as opposed to flat images that are gotten from x-rays. Tumors are outlined in three dimensions on a CT scan. Healthy organs are defined as well when scans are performed so that technicians can see areas that need to be avoided. Radiation beams are then organized in the best possible way to avoid healthy organs while delivering the highest dose of radiation possible to the cancerous tumor. Patients are placed in the same position as they were when their CT scan was performed. This allows for accurate placement of beams according to the scans that were obtained. Special software is used that calculates the total amount of radiation that will be delivered to the tumor and normal tissues to assure that the tumor is sufficiently covered in radiation while healthy tissues and organs receive as little radiation as possible. The radiation beams are adjusted even further based on the software’s calculations to give healthy doses of radiation while being manipulated into varying positions and shapes as defined by the tumor. Radiation beams are directed using one of two types of machines: Cerrobend blocks or multi-leaf collimators. Cerrobend blocks are individually shaped to form specific, custom-made shapes that create the correct beam for treatment. Multi-leaf collimators are skinny, metal blocks that move independent of one another in a quick, swift manner to form complex patterns to shape radiation treatment beams. They are commonly used in IMRT. IMRT is another form of delivering photons in the treatment of cancerous tumors with the possibility of lowering the dose of radiation delivered to non-cancerous tissues. Planning for IMRT begins in a similar fashion as 3D conformal radiation therapy in that it starts out with simulation. The tumor and organs are all outlined and shown as three-dimensional objects. Several beams of radiation are situated at varying points around the person in order to deliver the optimal amount of radiation. In IMRT, the beams are divided into a grid pattern. The large radiation beam is split into numerous smaller beams known as beamlets. Software is used to establish the appropriate pattern to break the beamlets down into from the larger beam to prevent radiation targeting healthy tissues while delivering the optimum radiation to the cancer. The multi-leaf collimators often form more than fifty different shapes during radiation treatment. The main advantage to this type of radiation therapy is that the patterns the beamlets form are precise and the radiation controlled. IMRT is often utilized when cancerous tumors are in positions that are difficult to treat. Often tumors that are directly adjacent to or wrapped around normal healthy organs, IMRT is used. Intensity modulated radiation therapy reshapes the radiation in the best possible way to avoid normal organs while delivering large doses of radiation to the tumor. IMRT is used commonly in the treatment of head and neck tumors where there are many other significant structures and organs that are near the tumor such as the spinal cord. The one downside to IMRT is that it can take longer to plan and deliver treatment than other 3D conformal therapy. Radiation can also be a bit more uneven as well because of the small beamlets that are being used. Although normal organs are out of danger of high doses of radiation larger number of normal organs receive low doses of radiation which can be a disadvantage. As of today, low doses of exposure to radiation are unknown. Tumors must continually be monitored for movement and shrinkage to ensure that radiation is being delivered to the cancer. Brachytherapy is a type of radiation therapy. Unlike other types where an external radiation machine known as a linear accelerator is used brachytherapy uses radiation that is implanted close to the cancerous cells. In brachytherapy radiation is implanted within your body as close to the cancerous cells as possible. A higher dose of radiation therapy can be given in a shorter amount of time than with types of external radiation therapy. Brachytherapy is not delivered through external radiation therapy but instead the radioactive materials are delivered using a hollow tube(catheter). The radioactive materials are implanted directly onto the cancerous tumor. The implants that are used can be either temporary or permanent. This form of radiation therapy allows treatment to be delivered to the cancer cells without damaging the normal tissues close to the cancer. Doctors use brachytherapy when they have decided that your best treatment option is a higher dose of radiation delivered directly to the cancer. External radiation offers lower doses of radiation than brachytherapy can. Higher doses of radiation are often needed for cancers such as: brain,breast, cervical, ovarian, head, neck, and lung. Implantation of the radiation can be delivered in two ways:through an outpatient procedure or another which requires general or local anesthesia and a stay at the hospital. How much time is needed for brachytherapy? The time needed to perform brachytherapy depends on whether it is being done on an inpatient or outpatient basis, the type of radiation therapy to be used, and the nature of your cancer. Internal radiation therapy can be done through the course of three to five treatments when done on an outpatient basis for a few minutes over a number of days while other types of internal radiation therapy is left in place for up to a week and requires a hospital stay during this period of time. Should side effects be expected? Although you will most likely avoid side effects during treatment you may feel some discomfort. Having a catheter put in place can cause tenderness. If you are given anesthesia when the catheter is implanted you can feel nauseous, weak, and drowsy. Medicine can be prescribed that allow you to relax while relieving your pain. If you experience any burning, excess sweating, or any other symptoms that seem unusual to your physician. What happens when the actual implant is removed? After the implant is removed the surrounding area can become sensitive for a bit although regular activity can be resumed when you feel ready. As with any procedure it is important to allow your body to rest, so you can fully recover after treatment. If you have a permanent implant installed rest assured, it will safely stay in place. Once the radiation is completely gone the capsule in which it is contained will become inactive and no longer providing radiation. Once installed medical equipment, such as linear accelerators, CT scanners, and other large scaled radiation therapy equipment must be properly maintained to ensure accurate results. Regular maintenance and service improves the longevity of equipment and increases equipment reliability. More often than not, health care facilities do not have the budget to maintain an in house equipment care team, instead services on equipment is outsourced. Medical equipment is specialized, and sophisticated, biomedical engineers are responsible for the services performed to ensure they are done properly, in a timely fashion, and by qualified service professionals. It is crucial that these elements are all focused on during the maintenance of facilities medical equipment inventory. This ensures equipment is maintained at the right time and application. One way that biomedical engineers keep up with the intricacies of each unique piece of equipment is by using historical data for reference and through overseeing equipment audits. This allows professionals to analyze their management programs to improve efficiency and compliance all while decreasing costs. Health care professionals should establish baselines on their equipment. Each facility is a different size and offers varied levels of technology. This is why it is inaccurate to use dollars spent as a comparison. Smaller, more budget conscience facilities may be required to purchase refurbished linear accelerators over brand new to stay within their facility’s financial requirements. A better measurement to use is a program’s cost of service ratio. This measurement accounts for technology and the expense of maintenance, the ratio helps determine the financial effectiveness of an equipment maintenance program. This ratio is found through the division of total annual costs of operations by the initial cost of procuring equipment. Establish a goal that provides your company direction on reducing costs while increasing overall efficiency. Medical equipment maintenance programs of the past have been based on an as needed basis for repairs. Equipment is not maintained and instead breakdowns are addressed as equipment breaks. Newer methodology involving medical equipment maintenance is time, predictive, and conditioned based to a new risk-based process. Prevention and corrective maintenance are now concerned with scheduled activities and repairs when equipment is out of service. This maintenance method prevents the ability to set service intervals based on useful data.